The way we sell everything seems to be changing, right alongside advancements in marketing and advertising. It’s no longer cost-effective to take out a weekly ad in the Sunday paper or slap your name on a billboard heading into downtown. These methods have grown more and more obsolete due partly to their decrease in success and partly to the development of more targeted and personalized marketing. This is especially true for the auto industry. The stereotypical tire-kicking car buyer has largely fallen by the wayside and made room for a more effective consumer experience. It’s no longer the norm to wait for buyers to come to you. In fact, 57 percent of salespeople believe buyers are less dependent on them during the buying process. If you want to make the sale, you have to be able to reach them effectively before they ever step foot on the lot. To do this, you need access to your audience’s behaviors, interests, income ranges, and more. According to a recent study by Cox Automotive, close to 60 percent of the total time spent purchasing a vehicle is dedicated to shopping online. This indicates a wealth of opportunity to reach shoppers digitally and cast a smaller net that will bring in more fish. Email marketing is especially effective, with segmented and targeted emails generating 58 percent of all revenue for marketers. Such tactics can save your business time and money while also converting at a maximum level. Here’s why you should start focusing on your in-market audience and how to make sure you reach them successfully. What Exactly Is an In-Market Car Shopper? At its simplest level, “in-market” defines a shopper looking to buy a car at some point in the near future. Car shoppers are now in-market for an average of 108 days, allowing for a fairly large timeframe to target and convert. However, you don’t just want to target everyone who might be purchasing a car soon. You need to look a bit deeper into the data to maximize your effectiveness. When people first begin to shop for a car, 6 out of 10 buyers are open to considering multiple vehicle options, and 80 percent start their search with a different manufacturer in mind than the one they buy. This indicates plenty of potential for conversion even if your dealership is not their first stop. However, if a buyer already knows she wants a Land Rover, you shouldn’t waste your time and money trying to sell her a Honda Civic. 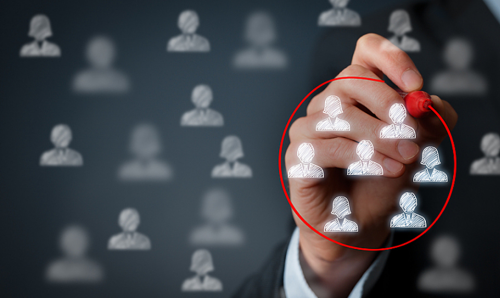 Your in-market targeting needs to focus on the people most likely to convert within your dealership, not just any dealership. The beauty of targeting in-market car buyers is the level to which you can narrow your search. You might start by targeting everyone looking to buy a car, but then you need to narrow even further to focus on the people most likely to buy one of your cars. Maybe they meet the right income level, geographic area, and age group you’re looking for—which keeps getting younger, by the way. By 2020, 40 percent of new car buyers will be millennials, of which 88 percent use the internet to research their car purchases. Digital targeting is only becoming more prominent, making it even more important to reach your in-market audience at the outset of their search before your competition does. That said, the in-market audience for Audi is different than that of Toyota, and their digital targeting strategies should vary, as well. Understanding and recognizing your unique in-market opportunities and knowing how to approach them is key to converting. Turning in-market opportunities into sales takes an understanding of the buyer and the interactions needed to best meet their needs. This can prove to be a problem, as 63 percent of marketers say generating traffic and leads is their top challenge. But imagine if you could target a buyer just as they enter the market for a new car, zeroing in on their lifecycle stage, recent interactions with your marketing, financing status, and more. The ability to use that info to tailor your prospect communications would be an invaluable advantage. Take for example a shopper whose vehicle is nearing 100,000 miles, is almost paid off, and who’s been frequently interacting with communications from your dealership. Now is the time to contact them about scheduling a test drive, knowing they’re looking to buy a car and that they’re a likely fit for your dealership. These data points and more can empower you to create lasting relationships and drive incremental sales. And it won’t require expensive ads to get these customers to convert. Today’s younger, more educated car buyer isn’t driving from lot to lot looking for a deal. They’re coming to the lot when they’re ready to buy, which means you need to reach them ahead of time to make sure the lot they show up at is yours. There are three primary factors that benefit from identifying and properly approaching your in-market audience: time, money, and conversion rate. Focusing your efforts on a segmented audience currently in the market for one of your cars saves time and money spent on crafting a broad marketing or advertising strategy that will reach more people but have less impact. You’ll no longer be spending as much money on print or radio ads and wasting time crafting generic creative. Instead you’ll be putting together marketing plans based on customers’ proven data and behaviors and using that info to tailor your message. These factors all work together to increase conversion rates once shoppers make it onto the lot, after you’ve already identified their needs and strategized towards closing the deal. In-market targeting can also enhance your existing customer relationships by helping them feel more understood and cared for via your personalized messaging. When you’re attempting to reach fewer people, you can focus more on the quality of your communications and providing better service to your audience. If you’re not aggressively targeting your unique in-market shoppers, you’re wasting your time and resources. As the first AI-driven marketing automation platform in the automotive industry, Outsell is here to empower you to easier and greater success. Contact us today to start converting the right shoppers the right way. Learn more about how our email marketing platform helps you target in-market car shoppers.